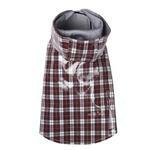 The Jake Plaid Dog Raincoat is the perfect solution to keep pups dry and comfortable! Retro brown and red plaid. Easy-to-clean polyester, with cotton lining. Adjustable touch fastener closure tabs at neck and belly. Sturdy metal D-ring for easy leash attachment. Since our four-legged friends seem to have trouble holding an umbrella for themselves, get them something better! This awesome raincoat from Pooch Outfitters is perfect for any rainy day! With bold plaid and comfortable cotton lining, this rain jacket looks and feel great! 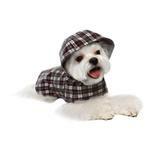 So, cover your pup up during the rainy season in this sleek number! Posted On 04/13/16 by Audrey M from Columbus, NJ Yes, Audrey M recommends this product! I love this little raincoat. The fit is perfect and my little Maltese, Abby, looks adorable in it. I highly recommend this raincoat. Delighted to find this seller. Many items to chose from in all categories.